Water Tanks With Standard 30-Degree Roof – Water Storage Tanks, Inc. The most common CorGal tanks in use are the tanks with 30-degree roofs. 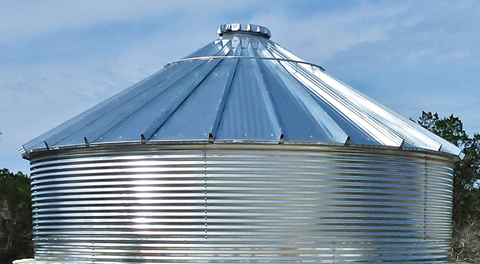 This standard tank consists of corrugated galvanized steel wall sheets with a 30-degree galvanized steel roof system. The standard 30-degree roof tanks are equipped with a geotextile preliner and a flexible membrane main liner for water containment. The corrugated high-rib roof (CHR) design is standard on all models 12′ diameter and larger. The 6′, 8′, and 9′ diameter models have a flat-seam (FS) roof as standard but the corrugated high-rib roof is available as an option. The 30-degree roof tanks are pre-engineered for water storage in a seismic zone 2B with a 90 MPH wind speed at a UBC Exposure C location. Roof snow load ratings are available for specific locations.